This versatile gown can be worn with the detachable short sleeve deep “V” neck back jacket; or worn without for a strapless sweetheart look. 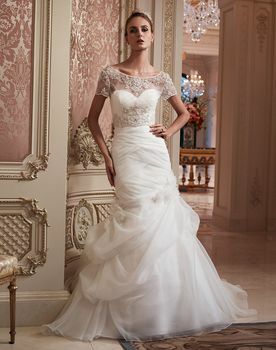 The gown has a fitted pleated bodice that flows into layers of soft pick-ups with appliqués and flowers. Bodice is adorned with crystal buttons.